Microsoft has released Windows Phone 7 Connector for Mac, an app that allows any Windows Phone device to sync with a Mac, allowing for copying of movies, music, pictures, podcasts and the other data you’d like to sync to a Windows Phone from OS X. The app is technically in beta but it seems to work reasonably well as Microsoft continues to update it. What’s particularly impressive about Windows Phone Connector is that it supports iTunes syncing, meaning it allows you to sync music, videos, photos, and podcasts directly from iTunes and iPhoto to a Windows Phone 7 mobile device, although content that is protected by DRM will not be synced. The app runs on Mac OS X 10.5 and later. 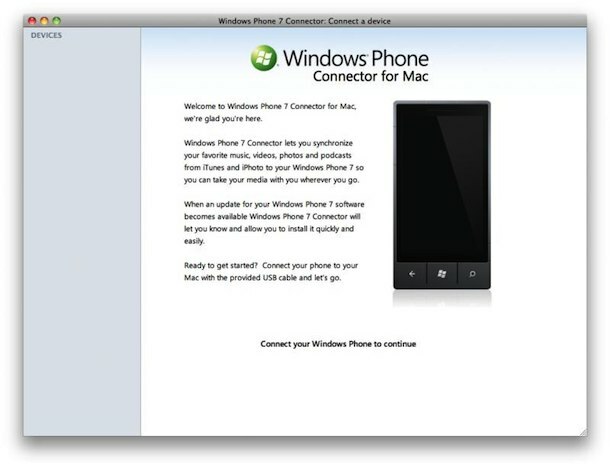 You can download Windows Phone 7 Connector for Mac here from Microsoft. Windows Phone 7 is Microsofts new adventure into the mobile landscape, made to compete with Apple’s iPhone and iOS, as well as Google’s Android offerings. It’s advancing quickly, and it’s a pretty interesting mobile OS, though it may be a tough sell for some iPhone users to convert to a new platform. I know they’re traditionally looked at like some kind of industry enemies, but I’m glad to see that Microsoft is committing to the Mac platform again with things like this tool and the new Office 2011 for Mac. Quite a few. My wife – an avid apple user – just switched to an HD7. Why? because the platform absolutely rocks. I do, and i love it. Windows Phone team did a great job on this devise….. I do and i do concur Windows phone is going to be the saure of the windows market. « What if you could check Star Wars weather via the Dashboard weather widget?